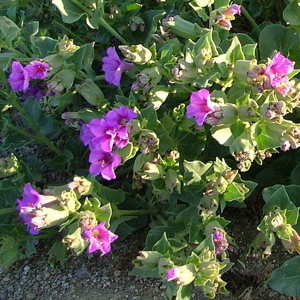 Colorado Four O’Clock is one of those plants that vanishes completely in the winter, retreating underground to an enormous root. Then, fairly late in the spring, shoots begin to emerge and once the plant starts growing—there’s just no stopping it! It can sprawl far and wide and looks lovely draped over a wall. Long-lived! More info here. Height x Width: 3-4 ft. x 3-4 ft.